The 2015 Verbal Guide will fully prepare you for the Verbal component of the GMAT exam, complete with 300 new questions and answer explanations. New to this edition is exclusive access to the online question bank that allows you to create practice tests from the over 300 retired GMAC questions featured in the book, as well as exclusive videos from real test takers and GMAC staff who share insight and tips on GMAT preparation. Improve your verbal skills by focusing your GMAT preparation on the area where you need the most help. You’ll get the same great questions and answer explanations from GMAT exam experts that you’ve come to expect from the Official Guide series. The GMAT Verbal Review online tool includes 300 actual Reading Comprehension, Critical Reasoning, and Sentence Correction questions from past GMAT tests. You can customize your question sets based on number of questions, item and question type, and difficulty level. This edition also features exclusive access to videos from real test takers and GMAC staff highlighting the skills necessary to perform well on the Verbal section of the exam and addressing concerns of non-native English speakers. 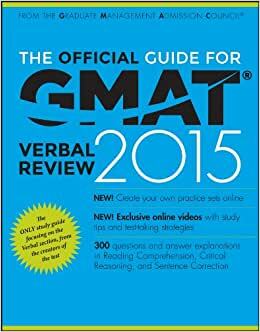 The preeminent source of verbal practice questions, The Official Guide for GMAT Verbal Review 2015 helps you target your study, customize your practice sessions and further hone your written and verbal skills. To use the question bank and Integrated Reasoning companion websites, you must have the latest version of one of the following browsers: Firefox 20+, Chrome 20+, Internet Explorer IE10+, Mac Safari 6.0+. Supported OS: Mac, Windows 7+. * Why is this book valuable/must-have? The Official Guide is published by the creators of the GMAT and therefore it is the only source of actual GMAT questions representative of what you will see on the test. * Why is the book not sufficient by itself? This Guide contains only questions and lacks insightful information about the test, a math/verbal concept review section, or any test-taking strategies. To get up to speed, you will need to get a study guide such as Kaplan Premier Program or Princeton Review's Cracking the GMAT Cat. * How should this book be used? This book should NOT be used as a study-guide. It is a collection of questions - think of it as a way to practice your test-taking strategies but not a way to learn them. * What if I own a previous edition of this book? If you have the 11th edition, the only difference between the two is 300 new questions, or about 30%. Most test-takers agree that 300 new questions is not a compelling enough reason to own both editions, as the 11th edition offers enough practice. If you do need additional practice questions, get the Math or Verbal workbooks instead as they each have 300 questions. * What is a recommended study plan using The Official Guide? Step 1: Buy a GMAT Guide from Kaplan or Princeton Review. Get familiar with the test and brush up on fundamentals (math and grammar); also these books will give you a good base for test-taking and timing strategies. Step 2: Take a GMAT Prep (2 free tests downloadable from MBA.com) - but don't waste these; these are free but very valuable tests. Take 1 after you go through the Guidebooks and save the second one for later. These tests will be representative of your GMAT score (plus/minus 40 points). Step 3: (Optional - if you want a 650+ score) Get a specialized Math and/or Verbal workbook from Kaplan, the 8-book set form Manhattan GMAT and do a deep dive into the fundamentals - this is what will help you crack the test - solid knowledge of Math and Grammar. Step 4: By now you should have a good understanding of question patterns, strategies, and timing. Start working on the Official Guide and honing your skills - this is especially important for Critical Reasoning questions that have certain unspoken patterns and rules that only the Official Guide offers - work through the questions to train your ear. Keep in mind that these questions are on the easier side if you are aiming for 650+. Founded by a Stanford MBA, GMAT Genius offers the highest quality GMAT preparation services to GMAT aspirants worldwide. Our mission is crystal-clear: to help you achieve GMAT success. 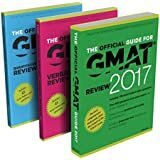 The publisher of the GMAT Official Guides asked GMAT Genius to help it improve the online versions of the Official Guides, and GMAT Genius has worked closely with the Official Guide publisher in the weeks leading up to the release of the 2017 editions. We have thoroughly analyzed the 2017 Official Guides and want to share our insights with you. Feel free to read our detailed analysis or skip down to our conclusions. The Official Guides for GMAT Review contain retired real GMAT questions, and are an essential component of your GMAT preparations. The GMAC places questions in order of increasing difficulty, based on its assessment of difficulty. The Quantitative Official Guide has no overlap with questions in the main Official Guide. The 2017 edition of this book contains 45 new questions out of the 300 total questions, representing 15% new content. These are new questions that we have not encountered before; they are not questions recycled from older GMAC resources. One formatting change in the 2017 edition is that all questions are now numbered from 1 to 300, whereas previously Problem Solving and Data Sufficiency were numbered independently. The Problem Solving section contains 26 new questions, with difficulty of Easy / Medium / Hard as follows: 17 / 5 / 4. This is in lieu of 26 questions from the 2016 edition that have been removed, with difficulty of Easy / Medium / Hard as follows: 16 / 8 / 2. The GMAC has also downgraded two questions from Medium difficulty to Easy. The Data Sufficiency section contains 19 new questions, with difficulty of Easy / Medium / Hard as follows: 7 / 7 / 5. This is in lieu of 19 questions from the 2016 edition that have been removed, with difficulty of Easy / Medium / Hard as follows: 3 / 1 / 15. The GMAC has not reclassified the difficulty of any question. The book includes an access code (see inside back cover) that provides 12-month usage of an online version of this Official Guide. Since the GMAT is a computer-based test, we believe that it is advisable to work though the questions online. We recommend that you use Exam Mode rather than Practice Mode, since we recommend that students practice using timed question sets that replicate test day conditions. 1) The test interface more closely resembles GMATPrep. 2) Exam Mode is now default mode, and you cannot skip questions in Exam Mode. 3) The overview screen shows the number of questions answered and that remain unanswered, for each question type and difficulty level. 4) All questions now indicate the corresponding book number, for easier cross-referencing. 5) The system now has a significantly longer period before it logs-out your session. 6) All session timing is now fully accurate. Our only significant concern with the online interface is that the system limits you to 10 saved sessions. Once you reach this limit, you must delete at least one saved session in order to keep practicing. But doing so puts all the questions from that saved session back into the unanswered question pool. As such, we recommend that you separately track which question types / difficulties you have already completed. Furthermore, we suggest completing all Easy questions in a maximum of 10 sessions, advancing to Medium questions in max 10 sessions, and finally focusing on the Hard questions in max 10 sessions towards the end of your prep. If you have any suggestions for further improving the online interface, please let us know and we will pass your input on to the publisher of the Official Guides. The Official Guides are for practicing with real GMAT questions, not for learning the underlying concepts. The book contains a 40-page Math Review section that provides a very high-level overview of the math concepts tested on the GMAT. This math review will be highly inadequate except perhaps for the most advanced math students. We recommend that you use additional study materials to learn the math concepts. Although all questions include answer explanations, many GMAT test takers are far from satisfied with these explanations. The explanations can be brief and hard-to-understand for non-advanced students. Furthermore, certain explanations are convoluted and overlook more efficient approaches. Despite these flaws, the Quantitative Official Guide is an essential source of GMAT practice, and nicely supplements the main GMAT Official Guide for additional practice questions. We believe that every GMAT aspirant must use this book (or the prior edition). For these reasons, we give this book a 5-star rating. For the best value, we recommend purchasing this book as part of The Official Guide to the GMAT Review 2017 Bundle + Question Bank + Video. If you already have the 2016 edition of this book, however, the replacement of 45 questions is not sufficient to make this book worth purchasing. GMAT Genius provides extensive analysis of the Official Guides on the GMAT Genius blog at GMATgenius.com/blog/. Click on the category Official Guides. You will also find extensive free GMAT preparation advice on the GMAT Genius website at GMATgenius.com/gmat-preparation/. In addition, we offer the highest-quality private GMAT tutoring to students worldwide. We wish you tremendous success with the GMAT!